Dry prairies. Occasionally on rocky barrens and dry, thin woods. Does not appear to compete well with grasses and usually is found growing in small colonies on sloping prairies. I have found this plant in sandy prairies and on infrequently used trails through oak savanna near Lake Michigan. Does not appear to compete well with grasses. In dry prairies with Amorpha canescens, Andropogon gerardii, Asclepias verticillata, Bouteloua curtipendula, Comandra umbellata, Dodecatheon meadia, Euphorbia corollata, Hypoxis hirsuta, Liatris aspera, Lithospermum canescens, Lobelia spicata, Petalostemum purpuream, Physostegia virginiana arenaria, Potentilla arguta, Ratibida pinnata, Silphium integrifolium deamii, Silphium laciniatum, Silphium terebinthinaceum, Sisyrinchium albidum, Solidago rigida, Sporobolus heterolepsis, Tradescantia ohiensis. Herbaceous perennial; stems erect, to 4-8" high. Minutely pubescent on the angles with eglandular curved-ascending hairs. Plant pubescent but eglandular. Main cauline leaves sessile, lance ovate or somewhat deltoid, up to 1.5 cm long, often less than twice as long as wide, entire, typically revolute margined, glabrous, or somewhat scabrous above, especially near the tip and margin, the lateral veins commonly 2 on each side of the midrib; petioles mostly under 3 mm, widespread. Uppermost sterile leaves 1-2 mm long, entire with a few low teeth, those subtending the flowers similar in shape and not much smaller. Flowers axillary, 7-9 mm, the short pedicels with curved-ascending hair; calyx eglandular; corolla 6-12 mm, lower lip of the corolla hirtellous in 2 lines. 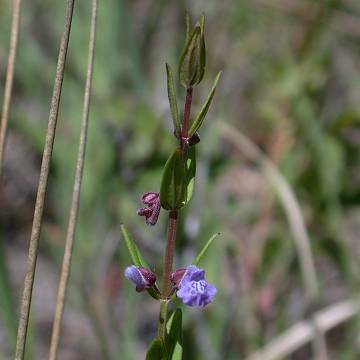 Gleason & Cronquist call this plant S. leonardii Epling. On rocky barrens the typical S. parvula is more frequent, with stems and calyx that are glandular and hairy and main leaves with 3-5 pairs of lateral veins..